Welcome to Garden Bloggers' Bloom Day for October 2011. Here in my USDA Hardiness Zone 5b garden in central Indiana the first two weeks of October have been some of the best "summer" days we've had all year. Out in the vegetable garden, it looks like summer with a volunteer petunia growing in a fallow bed where lettuce and radishes grew earlier in the spring. The marigolds look as fresh as ever, unaware of the pending change in weather. The zinnias have also never looked better this late in the season. There's no sign of powdery mildew on these zinnias, and no signs that they'll slow down blooming for awhile. I think both the marigolds and zinnias are doing so well because I sowed the seeds much later than in other years and we've not yet had any frost. But though the garden looks summer-like if you look in a few places, elsewhere it is decidedly fall. 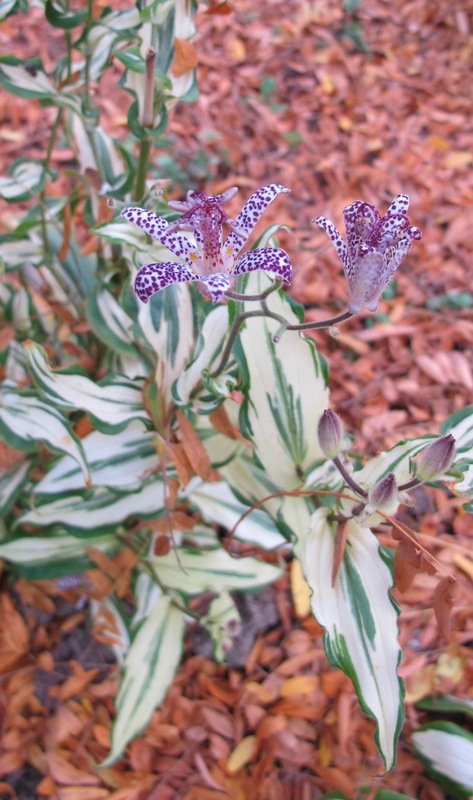 The toad-lilies, the last new blooms every year are winding down. This one is Tricyrtis 'Imperial Banner'. These asters, Symphyotrichum novae-angliae, a favorite passalong plant, are going strong. I also have some named varieties of asters elsewhere in the garden, but these asters will always be my favorite because they came from my aunt who originally got them from my Dad. Some of the trees also know it is fall. 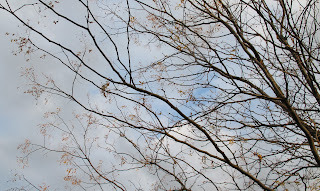 The honey locust tree has dropped almost all its leaves. 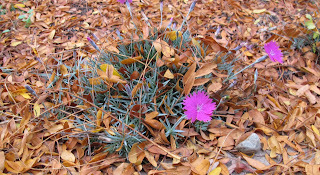 The fallen leaves nearly cover dianthus still sending out new shoots and blooms. Silly flowers. Don't they know that fall is here and someday, maybe next week, we will have a killing frost? Once that frost happens, even the red maple, Acer rubrum, will have to get with the fall program and turn more than one leaf red. That's what's blooming and changing in my garden here in mid-October. What's going on in your garden? What's blooming? My outrage at a gardening magazine's suggestion that gardens are pretty much done in the fall inspired me to write a post proving them wrong. Actually it resulted in three posts and this is the second. Happy GBBD. Wow, those are beautiful blooms for that late in the season. And I can't believe that red maple leaf. Happy bloom day (and thanks for hosting)! I love your volunteer petunia and marigolds. I've never grown toad lilies before, probably because I don't have much shade. We've had summer like weather this fall, too. The cooler temps are here for the next several days, and by Tuesday evening, I see it could get down to 33. I'm so not ready, but that doesn't matter. Thanks for continuing to host bloom day. I have never seen Tricyrtis 'Imperial Banner'. It is a winner with that white variegation! What's blooming? Dahlias galore. And the most pleasant froth from my own "cheap" aster, native flat-topped aster. The toad lily is a stunner. Beautiful zinnias and marigolds, Carol! I was late planting zinnias and a few other annuals this year, too, but it has turned out to be serendipity. The leaves may be falling, but the garden is still looking good. Let's enjoy this beautiful weather for as long as we can! Very cool aster. It's great how each plant has its season and that some really shine this time of year. I guess one benefit from this crazy weather is that you've got some summer left early in the fall?! The sentimentality of your asters is touching. It's nice that we can have so many fond memories rekindled by a plant tucked away in our gardens. Happy GBBD, Carol! Your Asters are amazing! This is the time of the year when we're extremely grateful to be living in freeze (almost frost) free San Francisco. The garden just keeps on going and going. Your blooms are really beautiful. I hope mine look half as good! You have some wonderful blooms this late in the year...beautiful October garden! Here in the northeast the fall color is already starting. Thanks for hosting and a Happy GBBD Carol! What an amazing toad lilly. I've given up on even growing the plain yellow flowering one as I can't get them through the winter here. If my recently planted zinnias do half as well as yours, I will have no complaints. Thank you for the opportunity to join the contributors for the garden bloggers bloom day. I love your asters...none in my garden, what a miss! I must get some in for next year, they really are an autumnal joy. Here in my part of the UK we are also having an unexpected burst of 'summer' - lovely! your two-tone marigolds remind me how many different types of marigolds there are. and aren't they satisfying to grow! i have some bright yellow ones this year that only recently slowed down...have made a note to plant lots more next year. thanks for hosting bloom day. it's fun to see everyone's posts. Hello, I found your blog through Gwen. This series is fantastic and I can’t believe it’s been going for so many years!! You should be very proud. This is my first GBBD too. Hello from a kind of warm and kind of wet New Zealand. I'm so happy that Alana from Ramblin' with AM pointed me to your blog -- I love the GBBD posts! Thanks for hosting them! Your toad lilies are quite pretty :) I've never seen those before. Hopefully in the next few months I'll actually have something blooming, so for now I did a sprout day post, lol. We are poised at the other tippingpoint from spring exuberance to wake me up when it is over summer heat. Wow, I can't even tell it's fall in your photos, Carol. It is very grey and very damp hereabouts. My container plants are doing great but only a few things are blooming now in the garden. I am glad to see I am not the only one enjoying an extended summer, but one without the heat and humidity. Other than the weather we share also share an appreciation of Zinnias this month. Thank you for another Bloom Day. LOVE that toad lily Carol! I've never seen one with variegation like that. Lots of nice blooms still in your garden. Happy Bloom Day, and thanks so much for hosting. 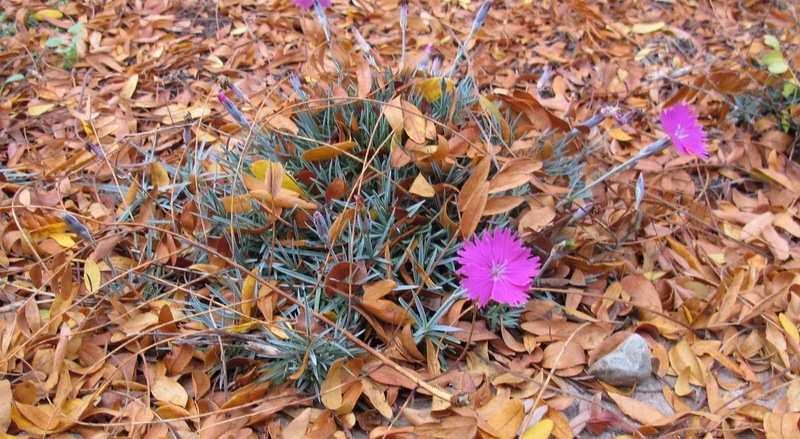 Annuals are so good at giving those last blooms of fall. You are so lucky to have a piece of your Dad's garden in your garden. Happy GBBD. Lovely blooms for so late in the year. Love the little toad lily. So tropical. Mid spring and glorious at our house, Australia. Wafts of wisteria, lilac and apple blossom fill the air. Love your toad lillies - I've never seen them before. 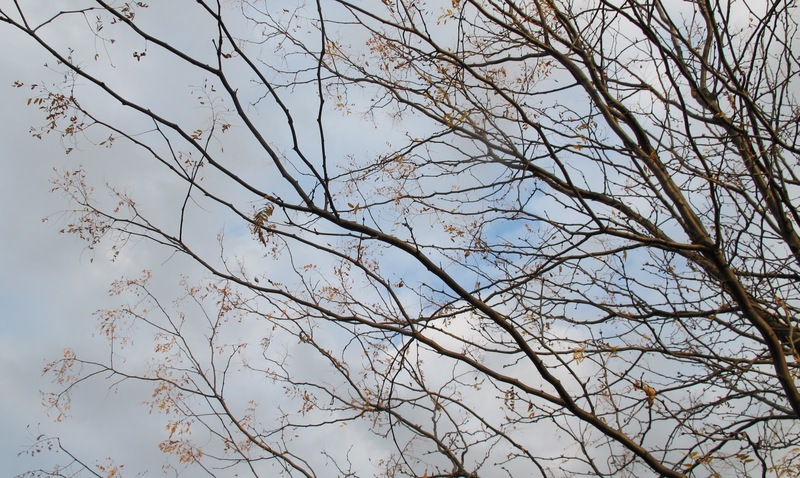 Oh, I love the shot of the bare tree branches. Ours down here in the deep south are not yet bare, but they will be, and one of my favorite sites, which sounds strange now that I think of it. Thanks so much for hosting GBBD and encouraging me to hope that one day I'll actually have a nice little flower garden. And to look at what I have. 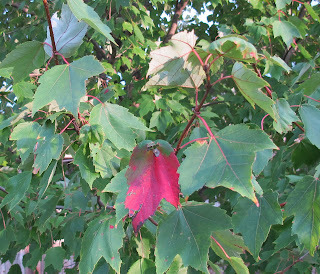 I just planted a red maple and look forward to watching it grow and turning a beautiful red in the fall. Your one leaf adds to the anticipation. Toad Lily is on my wish list which is rather long but someday! The variety you have ais quite stunning. Beautiful Zinnias! 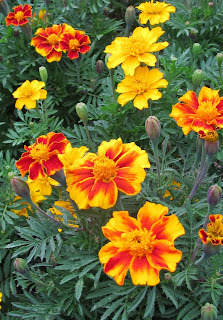 I have orange Marigolds blooming, too. So appropriate this time of year. 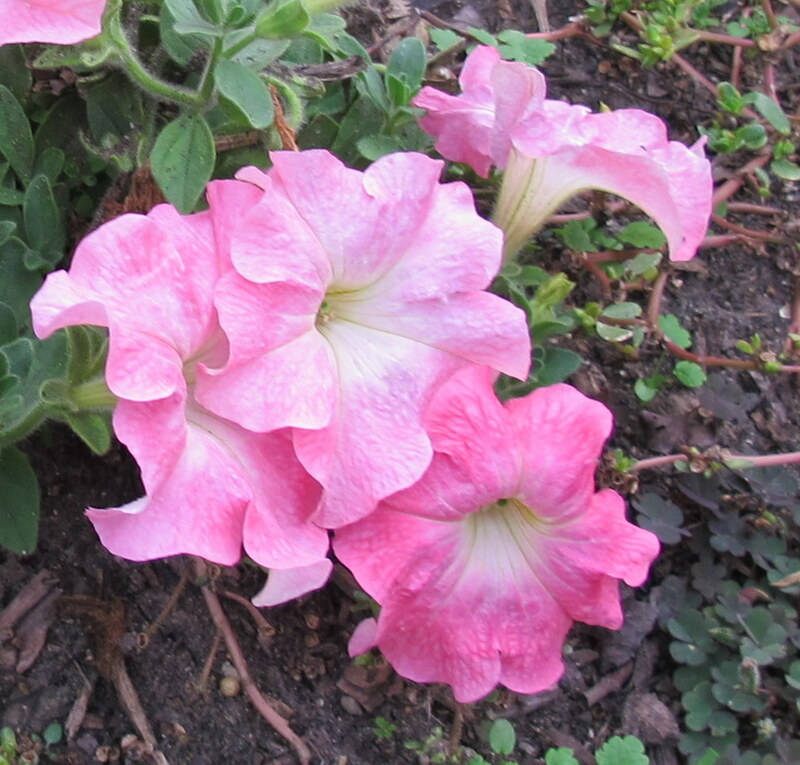 Volunteer petunias are among my favs. I see signs of fall but real leaf color comes later here, if at all. Thank you for hosting. My new notion for this Bloom Day is to visit only those who leave a comment on May Dreams; theirs will be the best posts. We, too, have had a summer-like fall (so far!). What a treat to see your toad-lily! Thanks for hosting bloom day! Thanks for hosting this event! 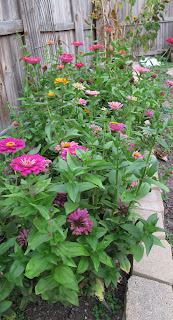 Your Zinnias look awesome:) Mine-not so much! gave up my "zinnia "space for a little veggie bed for my daughter this year and miss them terribly....love to see yours thanks! Love your variegated Toadlily. Happy bloom day! It never ceases to amaze me how different the climate is in what is theoretically the same hardiness zone. Those zone maps only tell us so much. My zinnias are long gone. That toadlilly photo is outstanding. unique would be another term. GBBD is cool. Fall is being fickle this year. Fine by me. Cold will descend soon enough. You have a lot blooming! Love the toad lilies! I hope your frosts stay away for a while so you can continue to enjoy the beauty in your garden. Love the toad lily! I've been meaning to add some to the garden for quite some time now..I also loved how wonderful your zinnias look! I fell in love with zinnias all over again this year after my daughter picked out a "Veggie Tales" seed packet of Thumbelina zinnias and planted the seeds herself. Will definitely do that again this year, as it added so much late-season sunny bed out front! Our maples are changing, but we don't have many leaves on the ground. We still have had some warm days this October. The leaf color in your maple is gorgeous. Thanks for hosting GBBD! Carol, your toad lily is beautiful. I planted a non-variegated variety back in May, but I'm pretty sure the deer ate them. My garden is in sad shape, if it weren't for annuals and volunteers, the only thing blooming would be my azaleas. Thanks, as always, for hosting GBBD. NICE zinnia, not to mention the toad lily - I forgot about that one! My garden is between seasons. I should have planted earlier for some late summer/early fall color, But as always I was reluctant to remove the summer annuals. Today i am going to the garden center for my fall flowers. I do love fall! Happy Bloom Day! It's good to see your Tricyrtis 'Imperial Banner' blooming. Mine suffered from transplant shock & stopped blooming. (Ok, it's my fault I didn't water it enough, but I have high hopes for next year.) It's such a beautiful plant. Happy Bloomday Carol! I love your fall blooms...there are a few in my garden too...http://dangergarden.blogspot.com/2011/10/bloomday-october-2011.html, so I'm having trouble with mr linky so I'm leaving my link here. Happy Bloom Day, Carol, and thanks once again for hosting my favorite gardening meme. I can't wait to visit everyone and see what's blooming this month! As my garden is in its last throes and getting ready for Autumn, it is so lovely to still be able to see some beautiful flowers, not to mention the photography. I'm wondering if that variegated toad lily makes a nice potted plant? I'd take it in a put in a windowsill for the leaves alone. Silly flowers! My zinnias too are sending out new buds. I hope they have time to bloom before frost. 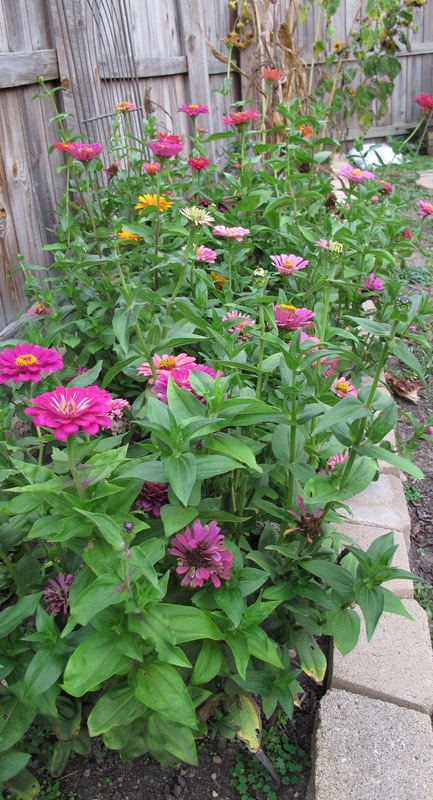 (How frost tolerant is zinnia, anyway?) 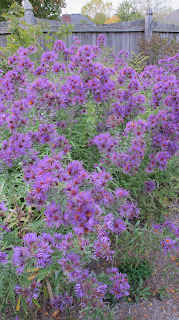 Love those asters --what a stunning color...Thanks, as always, for hosting! Although I can agree gardens in zone 5 United States aren't truly "done" just because it is fall, it is also true that this is the last outdoor blooming post for the year I'll be able to make. Today it is windy with on and off rain - but my blooms are hanging on. I'll be enjoying your other GBBD participants later! One of these days I'm going to take a chance on toad lilies in my zone 10. There's gotta be a species that can handle it, but I might have to have a go at 'Imperial Banner.' Wow. Pretty jealous of those nice clean Zinnias ! Nice zinnias for this late in zone 5b! It's a very nice border with them! We had a touch of frost here in central Wisconsin, but I still have some impatients in a pot I covered going strong. I also covered a tomato plant and they are still ripening up on a regular basis. It looks like I may actually have a couple to pick in November, I think that's a record here in Wisconsin! Enjoy seeing what others have blooming still. Thank you. I think some of the annuals look their best in the fall, when we're getting some cooler weather, especially at night. Their colors seem so much fresher to me. My dianthus are silly enough to rebloom now, too, and I even have a few candytuft flowers! Thank you for hosting this. I know I've gotten a few followers because of you! Would you be surprised if I told you I had tons of blue asters for Bloom Day? Delighted by your volunteer petunia. On the Lot right now, it’s the violas with their silly whiskers that refuse to stop popping up around the yard. Fall what? Love the asters. I purchased some for the first time this year to bring a bit more color to the Lot during fall. Do you care for them the same you would mums? Happy GBBD one & all! It's such a lovely time here in the garden, can't wait to share mine and see all of yours! I've have lots of volunteer asters, but yours beats them all! I have many plants that have come from friends' gardens and love the reminder of my friends when I look at the plants. And many thanks for hosting GBBD! I can't believe how many flowers you have still in bloom! Of course, if I focused more on the pretty than the practical, my garden might be the same way. Part of why I join this linking party is so I can balance out my garden a little more. That tricyrtis is lovely! I keep meaning to try them. We have flowers this month, but not for much longer as the rains have returned to drown them. Thank you, Carol, for hosting bloom Day! Thanks for hosting... I called my post "What is NOT Blooming"
Much in our garden doesn't seem to realise that the frosts are coming either, but it is so lovely to see the flowers still. Glad to see so much colour in your garden. My submission is of my visit to an orchid garden, not my own garden.Thanks for hosting. I'm loving the toad lily. Mine are beautifully in bloom as well and on my Garden Bloggers' Bloom posting. The variegation on your leaves is great, but even without it, they are an absolute winner for the fall garden. Your asters looks so grand, and the type of marigold i like too. I've been waiting for the GBBD post since Thursday, but we suffer unusually bod connection that i was able to link only now, Sunday afternoon. I am a bit disappointed that I am, maybe at the last number. I hope some people will still come back to see mine, hahaha! Love your toad lily. Mine has already decided it's winter! I knew it was the 15th, but somehow it slipped away from me! I look forward to this every month--reading all the posts is fascinating. Thanks for the invite! I really love that toad lily with the varigated foliage! I have a few blooms to share with you. That Trycirtis almost makes me want to give them another shot! It's so pretty! Love your beautiful autumn colours. Happy GBBD! Just set a new personal worst for finishing my Bloom Day post. Was out of town, but had chosen photos and wanted to get them out. I look forward to grazing posts from other Bloom Day participants. Happy GBBD and thanks for hosting! Zinnias are one of the few annuals we have in our garden - they are definitely a fall favorite here too! What wonderful contrasts in mid October - summer flowers still going strong coupled with your honey locust without any leaves. I love the picture of the single red leaf. There's lots of flowers hanging on over here too Carol as well as some surprising spring bloomers owing to the weird weather we've been having. My post went up on the 15th as usual, but I wasn't able to hop on over to add my link on the dot. 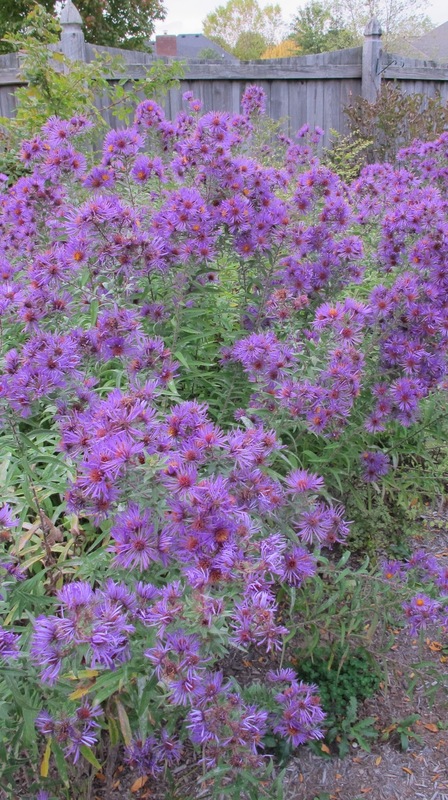 Fall aster seems to be a universal plant! Happy GBBD! I love the fall and wish it would stay longer, but unfortunately in the past few years it has changed from Summer to Winter and only given us a few short weeks of fall in the part of Georgia I live.